Ingalls Alignment Kits correct Caster, Camber and Toe problems associated with lowering you vehicle.ANY amount of ride height change will cause camber and toe to change. It might not always be visible but having your camber out of adjustment will cause the tire to run on the inside edge only. The lower you go the more negative camber you will get and the faster the tire will wear. Correct these issues BEFORE they become problems and take full advantage of your suspension with Ingalls Alignment Kits. Adjust camber up to 3 degrees with an Adjustable Ball Joint.Installs in the control arm for maximum control.One Kit Required Per Wheel. For maximum adjustment, choose the Adjustable Control Arm.Available with Rubber or Polyurethane Bushings. 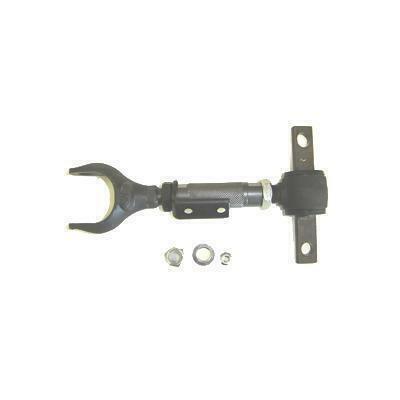 Replaces your OE control arm, available with new ball joints or reuse your OE ball joint. One Control Arm Required Per Wheel. Adjust camber up to 3 degreed with an Adjustable Upper control Arm Mount.Available with Rubber, Polyurethane or Brass Bushings (race only). One Kit Required Per Wheel. Adjust Camber with a Cam Bolt.Installs in the strut/shock for optimal adjustment.One Kit Required Per Wheel. Get precise camber adjustment with Ingalls Fastcam Bolts.Replaces OE non-adjustable equipment. Provides up to 2 degrees of change with one Fastcam Bolt, and 4 degrees with two Fastcam Bolts (per wheel). Correct Toe and Camber with Ingalls Shims. Installs easily for quick adjustment. One Shim Required Per Wheel. Adjust camber and toe with SmartArm Adjustable Links.Available with Rubber or Polyurethane Bushings.May replace OE Arm.One Kit Required Per Wheel.